Since my last update Delphi has been a bit like George Gershwin’s all time classic “Summertime and the livin’ is easy, fish are jumpin’ and the cotton is high”; with not so much as a drop of rain and temperatures reaching highs of 24 degrees C, which for here is about as good (or as bad depending on your point of view) as it gets. Truly magnificent weather for holidaying!! The fish have been jumping but it has been a bit more difficult to entice them to take. 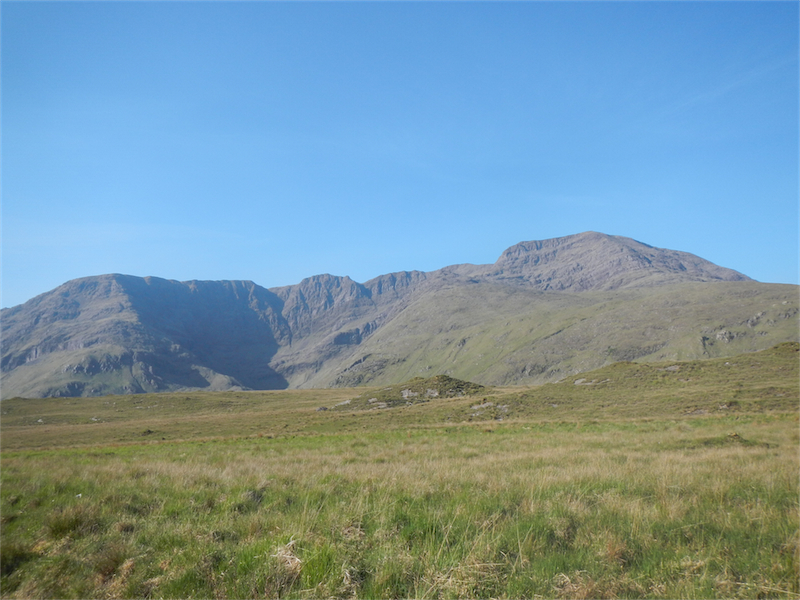 Having said that we have landed 8 since my last update which considering the low water, high temperatures, clear blue skies and calm conditions is actually excellent. 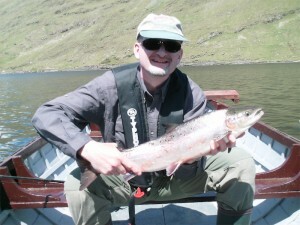 Paddy Laverty was first off the mark on Doolough on the 3rd with a relatively fresh fish of 10lbs from Fisherman’s Bay. 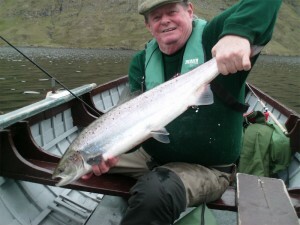 Peter Davis also had one off Fin on an Ally shrimp weighing in at 8lbs11ozs. On the 5th the ever efficient Seamus Maguire managed to wangle a sea liced fish of 3lbs from the Whin pool on a Willie Gunn mini tube. We managed to land three on the 7th, two off Doo, with Manfred Wolf having one of 11lbs at the Boat Pier and Kurt Roth landing one of 9lbs from the Ivy Rocks. 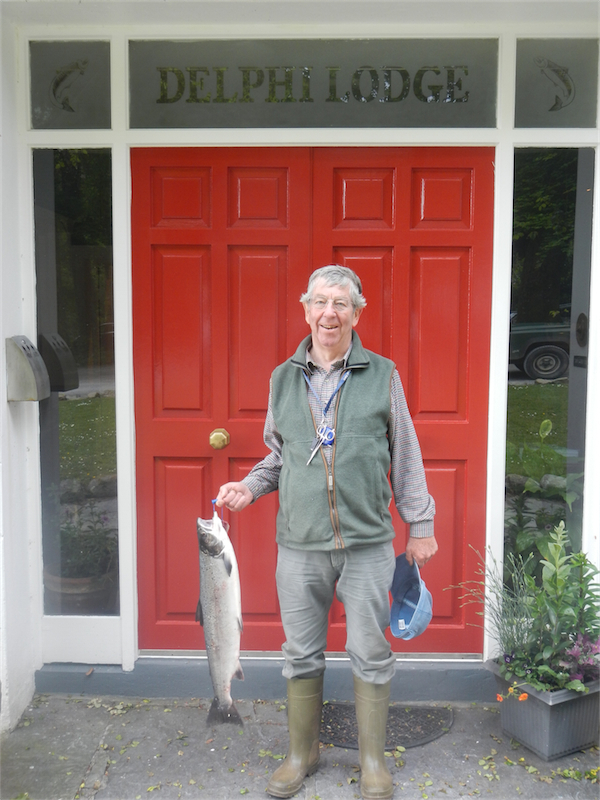 Finally Charles Harbottle had a fish of 7lbs2ozs off Fin on a Delphi Collie at 25mins to midnight (which even Urs would consider late!!). 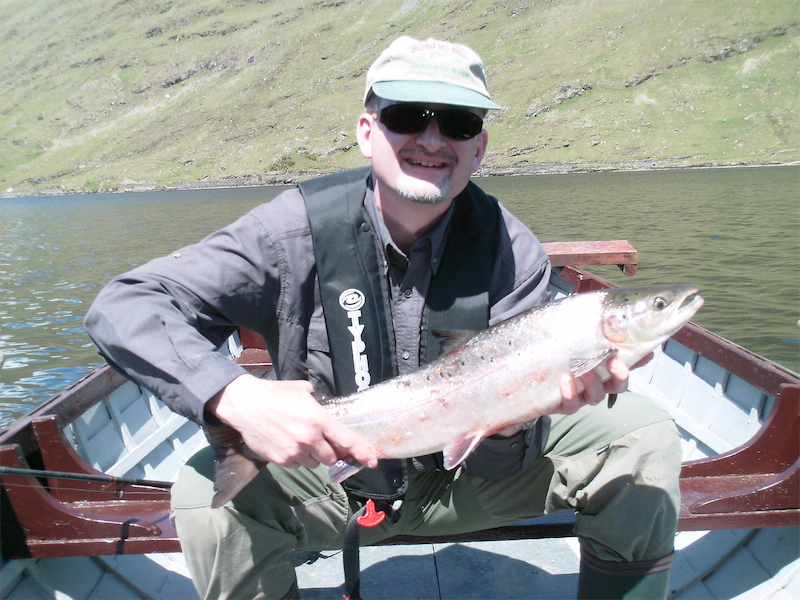 The 8th, Barry Brown had a sea liced fish of 3lbs8ozs off Fin on a Delphi Collie. Finally yesterday the old maestro himself John Mills got the Willie Gunn back into fashion when he landed a fish of 9lbs8ozs off Finlough. 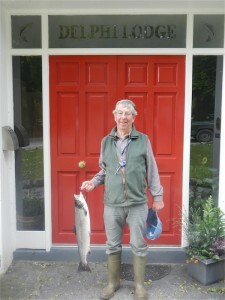 Amazingly it was John’s first fish of the year; so well done to him. At the time of writing fishing conditions are excellent and it looks like we are going to get some rain also, which will hopefully bring the river back into good fishing order. I know there has been one landed on Fin and a highly eminent competition angler committed the unforgivable. Having played a double figure fish for 15 minutes, he then decided it would be a good idea to start hand lining and everyone knows how the story ends. F— and a few more choice words like that.